This is one for the modern ‘Tread heads’ amongst you! This is a revised version updating the orginal to CMSF2, so you will need the base game CMSF2 to play this. Revised AI Plan using triggers; tweaked map using new CMSF terrain feautures. This is version 2 which has a slightly reduced mission time based on player feedback. The actual scenario is very loosely based on events in Daraya, a suburb of Damascus where rebels from the Free Syrian Army (FSA) have attempted to create a stronghold near Damascus centre. 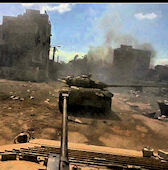 In August 2012, the Syrian Army defeated the rebel forces and took control of the town. After the failed rebel offensive in late July 2012 ,the Syrian army started a campaign against rebels in the Damascus suburb. This, the 2nd Battle of Darayya, is the ongoing battle between the Syrian Army and the rebels in the Damascus suburbs of Darayya. In mid-December when the Army intensified their attacks with heavy shelling and Tanks raids into the city. This is a fairly small map although it’s very built up. Can be played RT or WEGO. This is best played Blue Vs Red AI or H2H only. There are two RED AI Plans. If playing H2H it is recommended the more experienced player takes the RED side. The scenario is NOT playable as Red VS Blue AI. Many thanks to Buzz, Erwin and Snake Eye at the BFC forum who played through the early Blue Vs Red versions and provided a lot of feedback. Thanks to Lethaface and Sublime who played this H2H and provided excellent feedback in this regard. Thanks also to Slysniper who took the SF2 version for a spin and provided some useful feedback. Cheers Guys! 5 Comments on "CMSF 2 Daraya Tank Raid"
Outstanding street fight. I like it a lot. However, I could not keep 70 percet of my forces in the game (Need to try again). Tough mission indeed. Thanks for doing this one. Thanks again for playing this and for your feedback – much appreciated ta! Cheery! This is a really tense, addictive scenario. Hope to see more! Also.. I couldn’t find the ‘shot up buildings’ mod. Glad you enjoyed the scenario and thanks for your positive comments and feedback. Re LLF ‘shot up building’ mod it’s about to be uploaded to the new CMMODS but for now you can find it at the following Dropbox link: https://www.dropbox.com/sh/wwyy06b5lsfoqgo/AACOnCYJbSPAwdRzId5uD1R_a?dl=0 Thanks again for your comments.